Located near Canberra, Lake George is a large internally draining basin that was formed when the Lake George escarpment rose five million years ago. Lake George is in south-eastern NSW to the north of the NSW-ACT border. It adjoins the Murrumbidgee and Lachlan catchments in the west, and the Hawkesbury and Shoalhaven catchments in the east. Lake George has a small catchment area of 950 square kilometres, with the lake itself occupying 16 per cent of this area. The highest parts of the catchment lie along the Great Dividing Range in the east where elevations are up to 1,100 metres. The lake bed lies at an elevation of approximately 600 metres. The town of Bungendore lies south of the catchment, while the village of Collector is in the north. 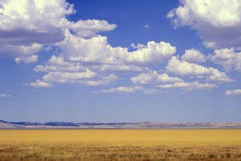 Lake George is 25 kilometres long, 10 kilometres wide, and very shallow. The lake has no surface outflow but water is lost through evaporation and underground seepage. This natural drainage basin is fed by 10 major tributaries that drain from the surrounding hilly country. These tributaries originally drained to the Yass River before they were cut off by the uplift of the Lake George Range. The northern part of the catchment is drained by Collector Creek, Tarago Creek and Currawang Creek, while the southern end of the catchment is drained by Butmaroo Creek and Turallo Creek. View real-time data from the Lake George catchment. Catchment land use is mainly grazing, which accounts for 76 per cent of all land use. The catchment does not have a major water storage with tourism, grazing and wine growing industries. There is a high reliance on groundwater, mainly for stock watering. Lake George is listed as a wetland of national significance in the Directory of Important Wetlands in Australia. When flooded it is an important habitat for waterbirds, as well as several threatened species. It is also of significant historical, cultural and scientific value. Rowes Lagoon north-east of the catchment is an upland wetland sustained by local rainfall and groundwater. When flooded the lagoon supports an extensive area of reeds and sedges and is a valuable waterbird habitat. To preserve water resources in river and groundwater systems for the long term, it is critical to balance the competing needs of the environment and water users. Water sharing plans establish rules for sharing water between the environmental needs of the river or aquifer, and water users, and also between different types of water use such as town water supply, rural domestic supply, stock watering, industry and irrigation.